Hello, Happy Hump Day. I'm off a day because of Monday being the Holiday. Worked in the bathroom this morning putting floor tiles down. Just putting new tiles around the toilet area, what a pain, all that cutting in. Going to finish tomorrow, hopefully. Tomorrow is my first Thursday going over to get Michael on the bus. Just me and him and the donuts now, as Megan went off to Middle School and has to leave at 6:50 am. I asked him last week, isn't it going to be weird, just the two of us and he said, no I think we should celebrate! Spoken like a true brother! corners, and sentiment (Karen Lockhart), 3 Designer papers, Cosmo Cricket, Matilda, and 4 flowers, stamped and cut from a PSX Stamp. I love these cupcake images! I colored with Copics. 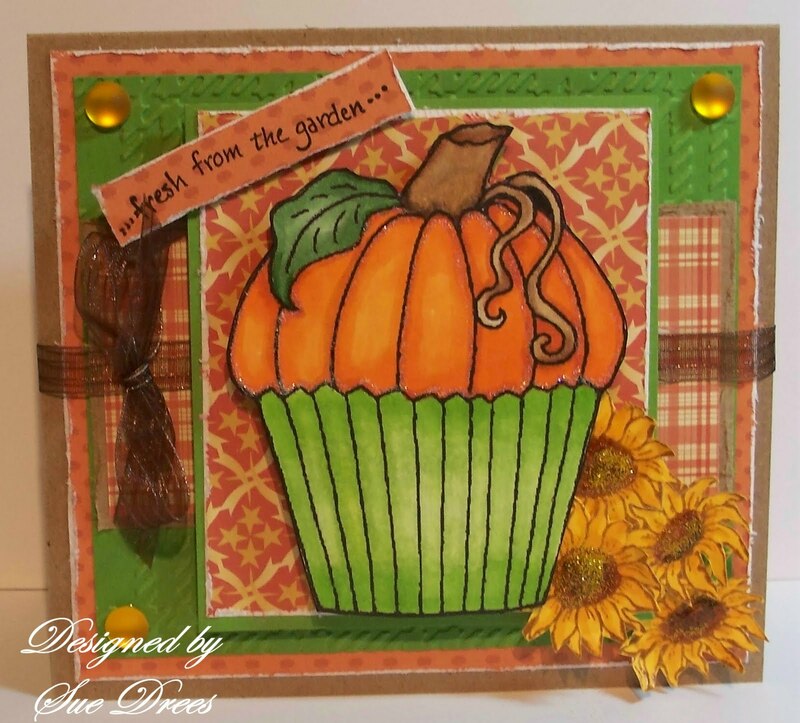 The embossed card stock is plaid from Sizzix. I distressed every other layer for texture. 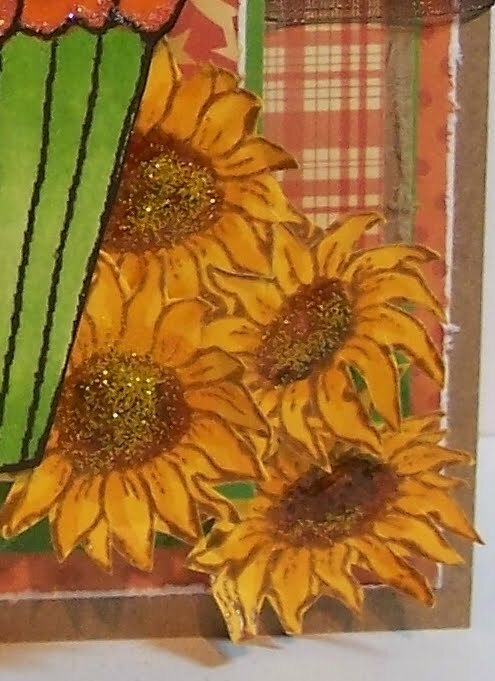 The centers of the sunflowers, I used Papier Glass Finish (AC Moore) and sprinkled a little gold glitter on top. 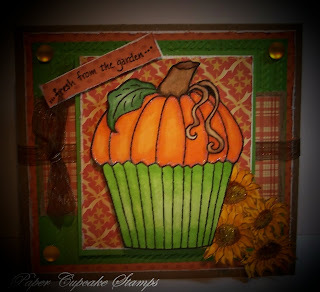 I so love this pumpkin cupcake! Fun!!!! Woww a wonderfull card Sue! Love the warm colours! So beautiful card Sue,I love the image and your papers. What a great fall card Sue! 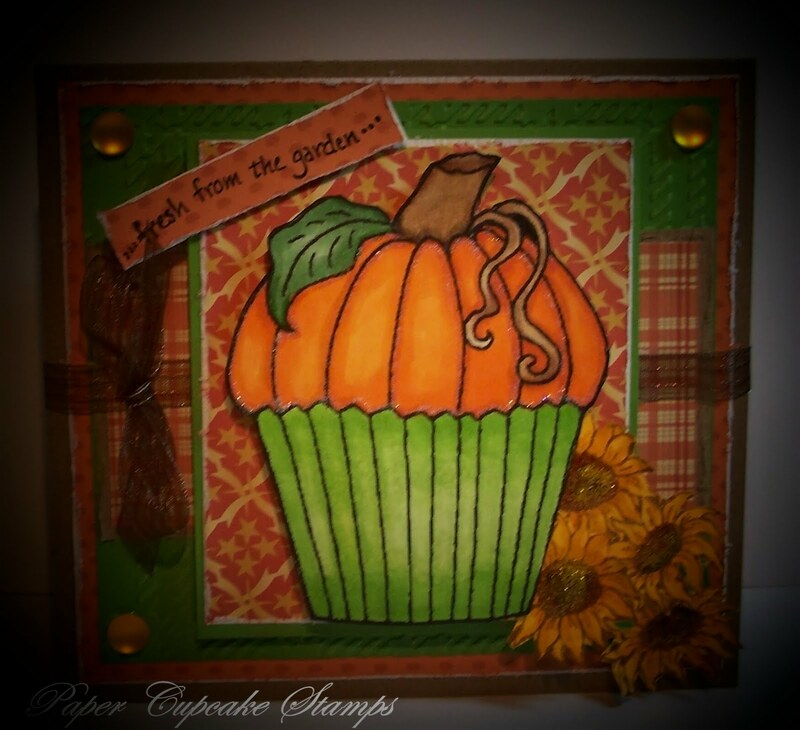 I just love how you coloured the pumpkin is just so radiant....beautifully done! Holy cow! A lot went into that card and it is just fabulous! Love the image. Thanks for sharing. Have fun with the little guy! Oh yum!!!! I can't wait, frankly, autumn is making its way to the states, slowly but surely and I am thrilled!!! I can't wait til we can make homemade pumpkin muffins and apple pies and awwwww, good times, it will be nice to open the windows after a hot, humid summer. This card, I can't decide if it will hold me over til then or if it is making more eager, lol!! Very cute, nevertheless, love the colours and textures and the images are just darling! !